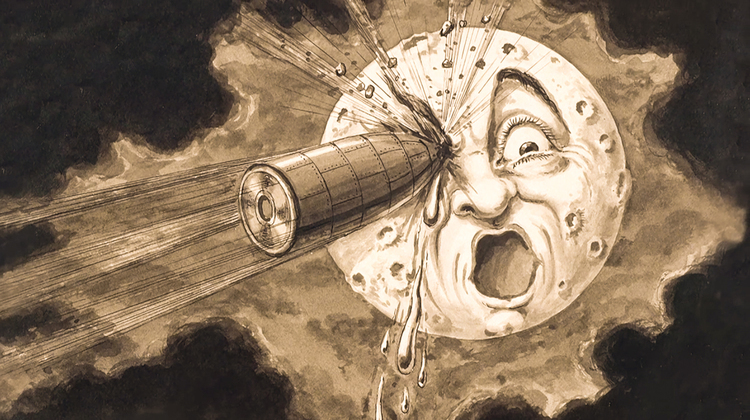 Have you ever seen Méliès’s A Trip to the Moon (1902) or Luis Brunel’s Un Chien Andalou (1929)? OK, what about Andy Warhol’s Kiss (1963) or Antony Balch’s The Cut-Ups (1966)? I’m guessing most of you have seen the music video for Michael Jackson’s Thriller or Queen’s Bohemian Rhapsody? These are just a few of the examples of great short films from over the centuries. The short film has a truly fascinating history. Today, even most film enthusiasts don’t really know that much about the subject. While this is a sad reflection of how neglected short movies have been over the past 50 years, this is actually something that makes the subject all the more interesting. It was Thomas Edison that first introduced the new medium of moving pictures to American audiences. Back in the late 1800’s, he began working on a machine that would show moving photographs for the very first time. His machine, which he called the Kinetoscope, would finally be ready in 1894. His invention was a far cry from the large screen movie theatres we have come to associate with films today. The Kinetoscope could only entertain one viewer at a time. They would have to stare into the machine through what looked like a set of mini binoculars. Inside, they would see a short moving picture of a staged event, like two people boxing, for example. It would be no more than a few seconds long and would not have any audio accompaniment. 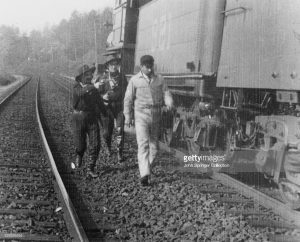 Bandits hold the train conductor at gunpoint in a scene from The Great Train Robbery. Meanwhile, in Europe, two brothers were working hard on another cinematic format. Their approach was to use a projector to display film sequences on a screen so that lots of people could watch it at once. The Lumiere Brothers are commonly considered to have been the first to have shown the real power of cinema on audiences. While the story remains unconfirmed, it has been said that the premiere of their film Arrival of a Train at La Ciotat (1895), members of the audience were so scared at the sight of a train coming straight towards them that they ran screaming from the movie theatre. What Would A Movie Become? Like all new art forms, movies had to find their place. The first films were simply one-shot ‘action’ sequences. Since no process of editing had yet been invented, the first years of film comprised of short movies of things like a train pulling into a station or people dancing. Within a few years, however, filmmakers realized that they could add multiple cuts and tell stories much in the same way that the theatre did. This caused an explosion in the different types of films being made. Suddenly, different genres started to appear. Filmmakers began to make romances, westerns, comedies, horrors, and even bizarre experimental works such as Louis Méliès’ A Trip to the Moon. Perhaps the most famous of these early films was Edwin S Porter’s The Great Train Robbery (1903), which many believe to be the best example of early cinema. By the early 1900’s, it was clear that cinema was going to comprise of many different styles and genres. One of the biggest leaps forward that occurred in movies happened in the early 1910’s. In the ten years before, the average film length had risen from a few minutes to around 20. The 1910’s would see the release of DW Griffith’s The Birth of a Nation (1915), a film that had a running time of over 3 hours. The success of this film was a real game changer. Film running times leap up into the 1 hour plus very within a decade or so after its release. Despite short films enjoying their golden period during the 1910’s and early 1920’s, the writing was already on the wall. You might not know it, but during the 1910’s and 1920’s, Charlie Chaplin was claimed to be the most famous man alive. 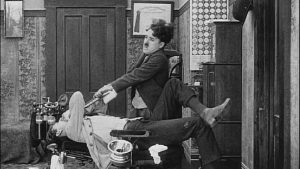 His comedy short films like Laughing Gas (1914) and The Champion (1915) made him the first real international star. It was the 1910’s that really made movies one of the worlds most loved and revered hobbies. Audiences throughout the US and Europe were able to see movies in converted theatres and even the kinds of traveling circuses that were famously depicted in Jacques Tati’s Jour De Fate (1949). Chaplin is an interesting case study for those people wishing to chart the early history of film. During the early 1920’s he was visionary enough to see the writing on the wall. He made his last short in 1923 and then switched to making what we now call feature films. Though the lengthening of running times was more evolutionary than a huge leap forward, he had a gift for understanding his audience. Longer running times meant more bang for their buck. Not only that, but longer films also meant story tellers could tell more complex stories and develop characters better too. So it was that during the 1920’s and early 1930’s, short films began to decline. Despite this, there were still lots of short films being made. One genre that flourished, and continues to florist up until this very day is the cartoon. Disney films, in particular, would help keep mainstream shorts alive. During WW2, short films underwent something of a revival thanks to their use as a propaganda tool. Famous A-list Hollywood directors like Frank Capra were drafted in to make such films for the war department. Another area where shorts would flourish was experimental film. Due to the limited appeal of such films, it was often hard to find the money to make lengthy experimental films. While we tend to think of the golden era of experimental shorts as being in the 1960’s, and with filmmakers such as Andy Warhol, the genre has been extremely productive ever since the days of Méliès. The explosion of Music Television during the 1980’s saw money pouring back into short films. It wasn’t long before acts like Michael Jackson were employing the services of A-list Hollywood directors to shoot their short films. This not only helped to shine a light on short films but also brought a great deal of artistry back to them as well. Suddenly, directors were proud to call themselves short filmmakers once more. Increasingly, international festivals and award ceremonies began to include awards for short films. At the same time, inexpensive cameras came on the market meaning that just about anyone could make a short film. By the year 2010, filmmakers had even begun using smartphones to make short films as well. Today, 10’s of millions of shorts get made each year. While most might only have a limited appeal, technology has made short filmmakers out of us all. It seems almost inevitable that short films are going to become mainstream once again.